← Planet 9: A New Planet in Our Solar System? Where it is, where it came from, and why there’s a chance it’s not there at all. 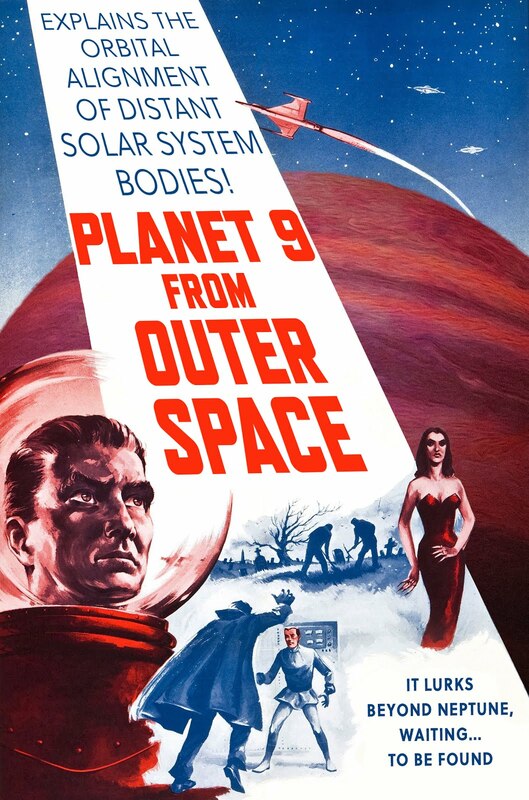 Planet 9 poster. Credit: @micquai (the Find Planet Nine blog). Last week, I wrote about the not-quite-discovery of a ninth planet in our Solar System (and I don’t mean Pluto), way, way beyond the orbit of Neptune. 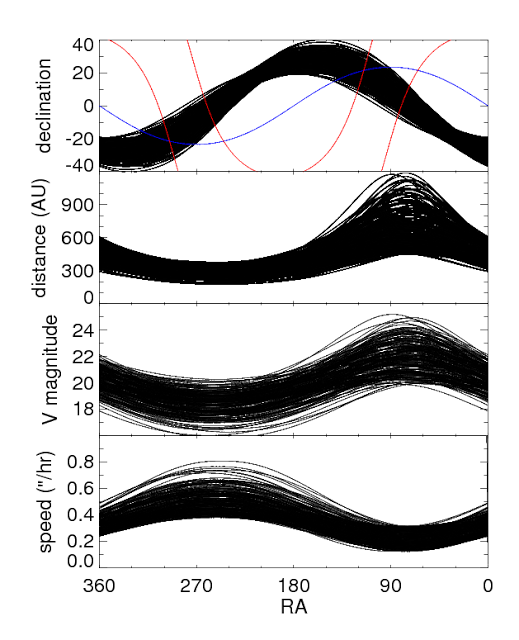 I wanted to follow up on this with a little more detail, mainly because Mike Brown and Konstantin Batygin put up a blog about their new discovery and the search for Planet 9.
Credit: M. Brown & K. Batygin. The top panel is an actual map of the sky. The red lines mark the Milky Way, and the blue line is the ecliptic. The second panel tells more about the possible orbits of Planet 9–specifically, its distance from the Sun. Although the media reported the minimum distance as 200 AU, the perihelion could actually be anywhere from 200 AU to 400 AU, and the aphelion anywhere from 500 AU to 1200 AU. Almost the only place Planet 9 could have gone unnoticed is also the place where it is most of the time: far from the Sun, slow-moving, faint, and also probably in the dense star fields of the Milky Way. It won’t be easy to find there, but it’s definitely feasible within the next five years. And I wouldn’t be surprise if it turns up sooner–if someone goes through other sets of old images and finds it as a “precovery“. In fact, in the comment section of his own blog, another astronomer informed Dr. Brown of the Spacewatch archives, which could also be useful to search through. So now that we have a better idea of where Planet 9 is, where did it come from? Well, basic planet formation theory says it had to have formed in the original protoplanetary disk that formed the other planets. Early in the Solar System’s history, it would have to have had a close encounter with another planet to be thrown out to a large distance. Now, normally, it would come back to where it started unless something else big bumped it into an orbit that always stays far from the Sun. That could have been another nearby star in the star cluster where the Sun formed. This scenario is actually predicted by one of the theories of how the Solar System formed: the fifth giant planet hypothesis, postulated in 2011, which says there were originally five giant planets in our Solar System instead of four. If Planet 9 is found, it would lend a lot of support to this model. Now, how sure are we really that Planet 9 exists? Well, Dr. Brown addressed that in more detail in this post. First off, while it appears that there is only a 0.007% chance of the curious alignment of outer Solar System objects happening by chance, there could always be other reasons for it that no one has thought of yet. The most obvious way it could happen is if there’s a planet out there, but it’s different from what Brown and Batygin think it is. They didn’t have time to simulate all the possibilities, after all. But even before we find Planet 9, there is a way to strengthen the theory: just look for other objects out there. If Planet 9 is there, we should be able to find more objects on weird, but similar orbits like Sedna, and if we do find some, that would make it much more certain that Planet 9 is there, too. This entry was posted in Science, Space and tagged Konstantin Batygin, mike brown, Planet 9, Planet Nine. Bookmark the permalink.